Well, maybe that is an exaggeration…… I really just lost count and started over. Sometimes a mistake or an error can lead to a learning. I set up the poles in my garden for my pole beans just a few weeks ago. I planted both a purple variety and what I thought were the Blue Lake pole variety. The purple variety are up to the 8 foot level and setting blossoms. My green pole beans acted like they were stunted. 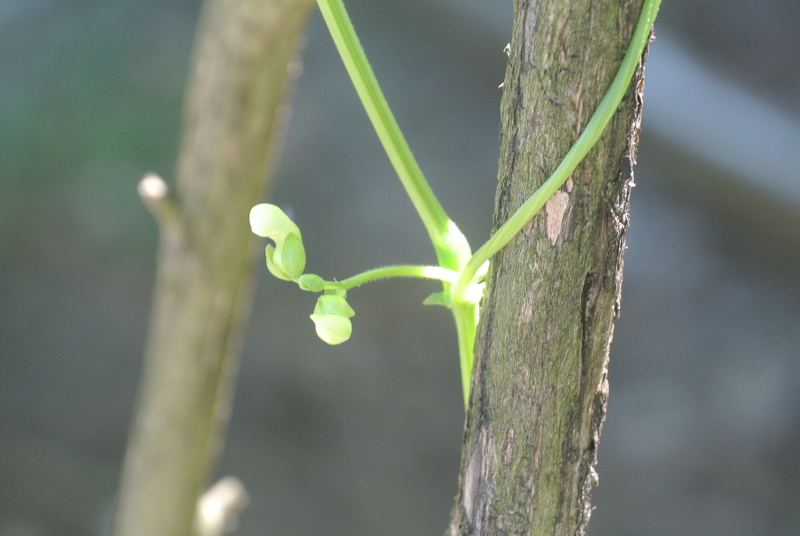 Guess what, those stunted beans are just 12 inches tall and loaded with blossoms…. 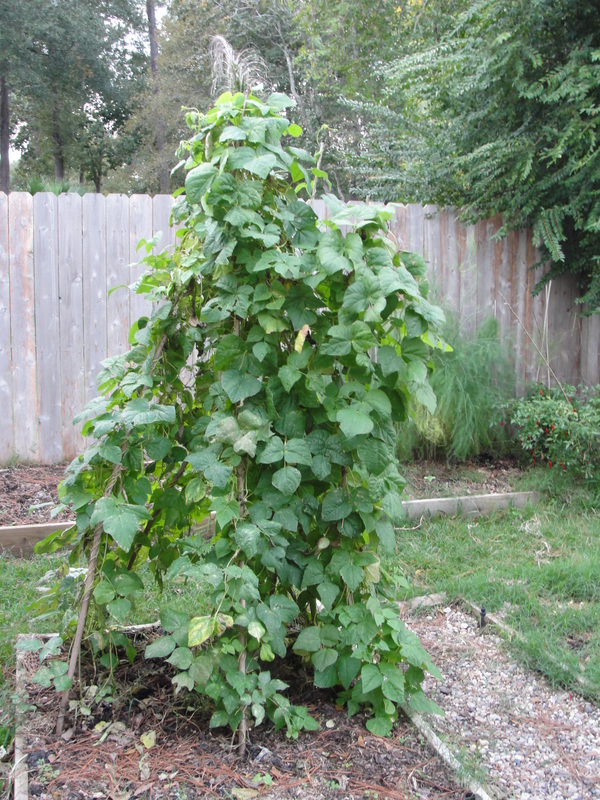 You probably figured out my error….I planted bush beans! It will be OK though. The bush beans will be done shortly and the poles are still there waiting to be wrapped up with the vines of the pole beans – so into the ground went the “real” pole beans. 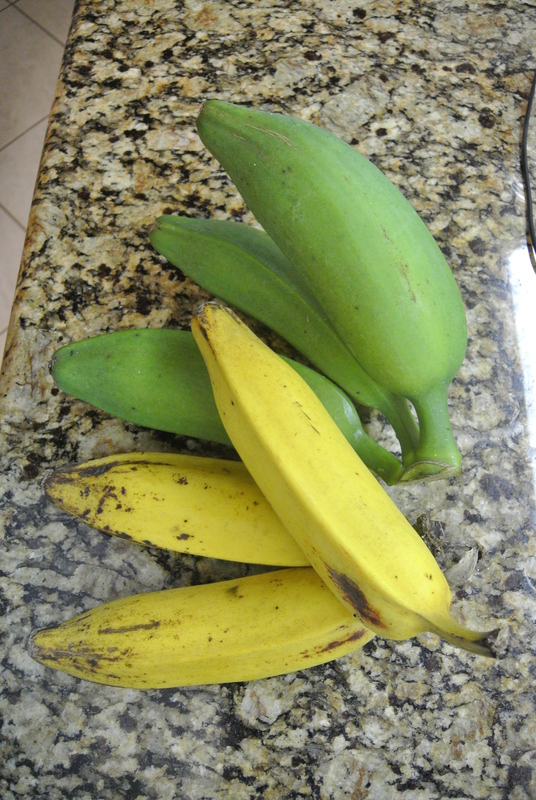 I should get an extended harvest…may have to remember to do it again in the late summer for a fall harvest. If CRS doesn’t overwhelm me I will plan it for next spring…seems like a good idea! – CRS is “Can’t Remember Shtuff” I run into it on an increasing frequency now… When it gets real bad it won’t bother me because I won’t recall that I have forgot whatever it was…. 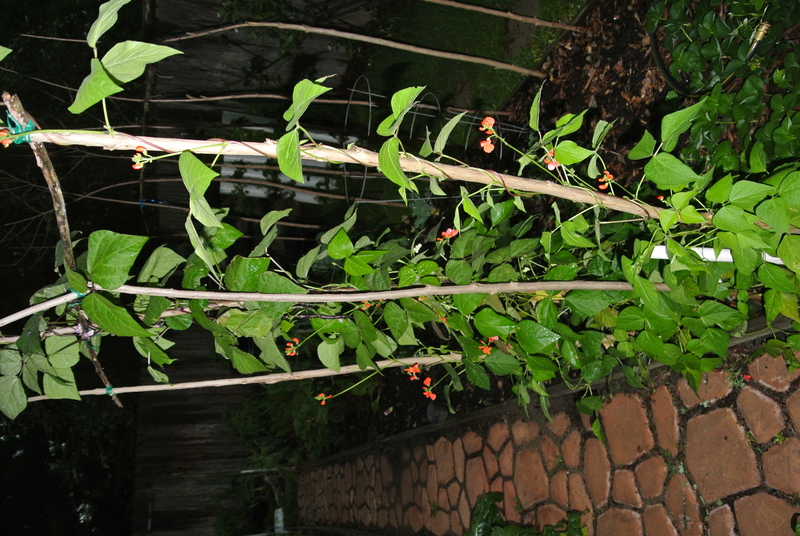 The example below is one of my pole bean teepees from a couple of seasons ago….prolific is an understatement! This is an example of pole beans doing what pole beans do best! Obviously much more than a 12 inch bush bean plant! I appreciate all that they do for me and my Garden! A perfect strawberry blossom on it’s way to my table. I took the camera into the garden the last few days….I am always impressed by the perfection in nature…. Just returned to Houston yesterday from a quick meeting with a client in lovely Midland, TX. I guess there really is no rest for the old guys wanting to retire. I am not sure what retirement means because I don’t ever picture myself without an “avocation”. An activity taken up in addition to one’s regular work or profession, usually for enjoyment; a hobby. One’s regular work or profession. Archaic A distraction or diversion. I think my vision of an avocation will be a blend of definition 1 and 3. Oh yes….I have been accused of being a bit archaic by my children……they seem to grow out of that phase but it does take some time. I can be a distraction and a diversion as well as being distracted on occasion. I am constantly diverting my attention between the large number of activities that fit in definition “one” above. Gardening is high on the list as is photography, fishing, bicycling, blogging, canning, sweating in the gym, day dreaming and I’m sure that Kathy would add a couple more to the list. Definitions one and three in my life right now are pretty broad. I do love tending my garden. I did wait at least 25 minutes after my return home from this trip before wandering out into the garden to check on things. I have been advised that it does not bode well to go to the garden immediately upon return, I need to see and visit with Kathy for a bit and then wander off. I enjoyed my bicycle ride down to the local Starbucks this morning.Today at 5:45 AM it was dark, the air was crisp on the face and I had to smile a little inside at all of those folks rushing off to their definition “2” of the avocation term. I do not miss that morning rush one bit. I also thought of my best friend John, by the way – he was on his rush to work at least 20 minutes before my ride began, I know he is looking forward to the time where he can choose either 1 or 3. He is a bit like me and I am certain that he is capable of blending the two admirably. Wow, the garden is taking off! 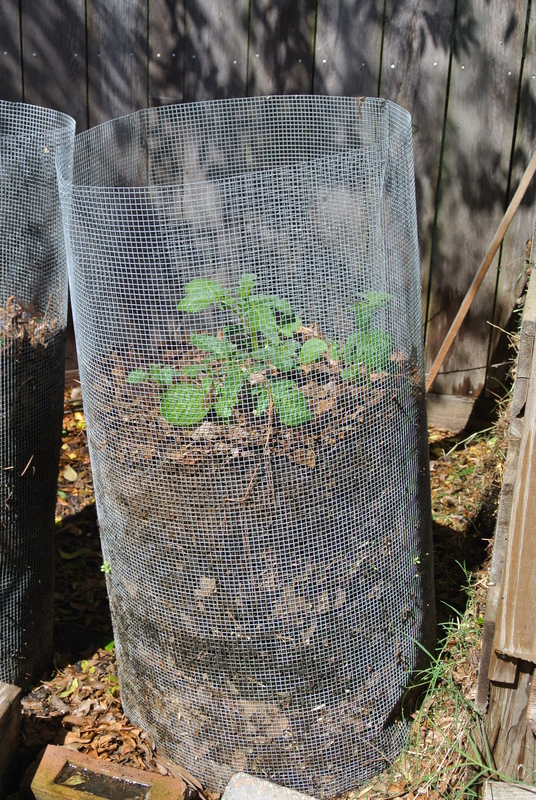 The Yukon Gold potato plants in the wire cage are huge. Below is a picture from March 2nd. Yesterday, the 21st, I adding more shredded leaves bringing the level up to the brim. 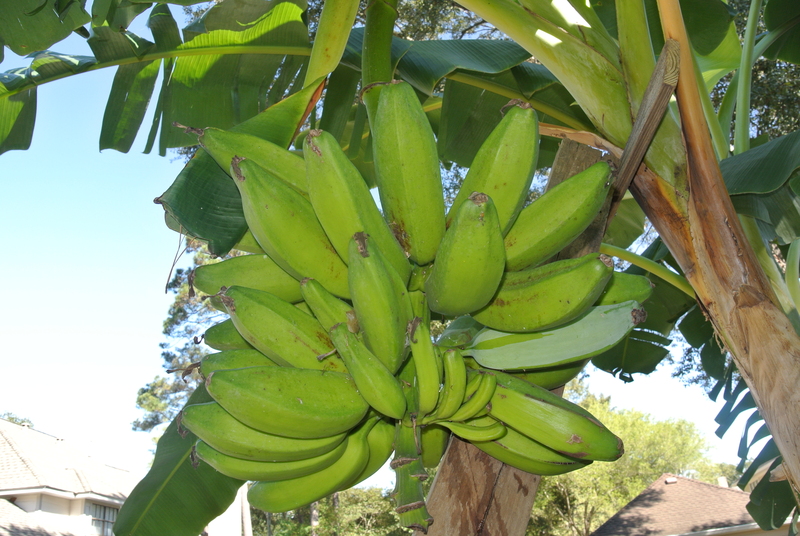 My estimate – the tops of the plants are now 30-36 inches above the planting depth. I am so anxious to see and yes, taste the results. Back on March 2nd this is the image....yesterday the 21st the plants are over the top. The picture is straight - the cage is listing to the left. The sugar snap peas are nearly finished….I did get to eat a handful while roaming around yesterday. I harvested a few more asparagus spears and they graced the table last night. Added a few more ugly and misshapen strawberries to the freezer. Hun, I am saving the best ones for you to eat fresh. 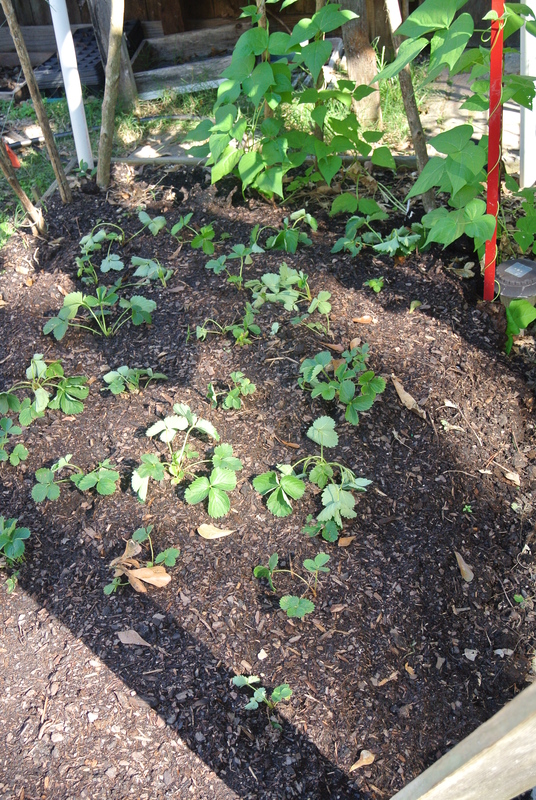 The cucumber seedlings are all up, oh….not the pickling cukes….I planted them a week behind, so almost all are up! The pole beans, both green and purple, are ready to grab the poles for their upward spiraling dance. I have got to see if I can manage some room in John’s garden for a tepee of beans. I noticed the absence of of the wonderful scent of the Meyer Lemon tree blossoms. 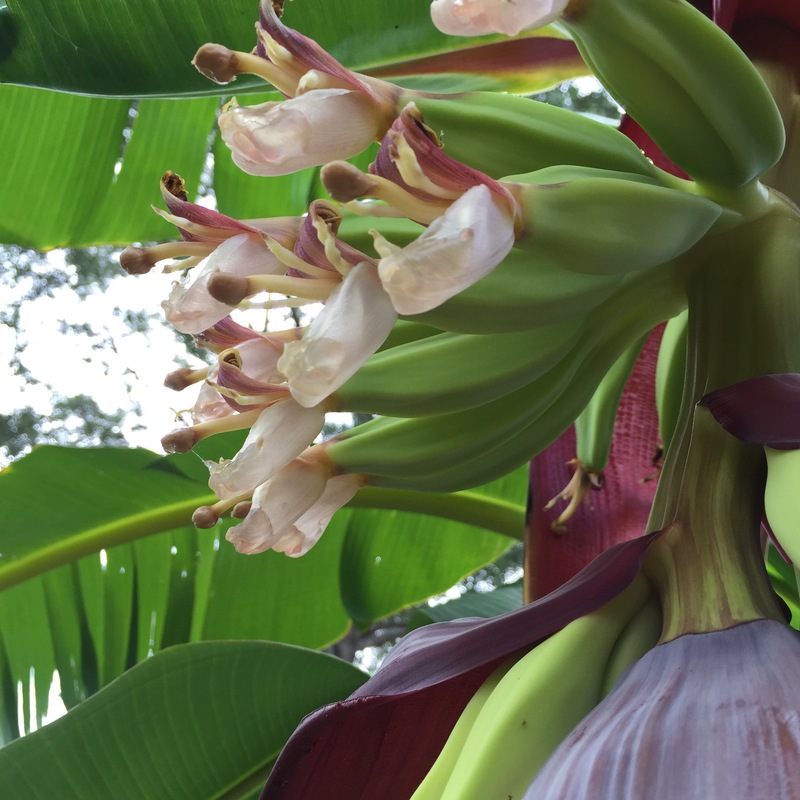 If I could only find a way to capture and bottle that scent I could add another to my list of avocations – and maybe make a pot full of money doing it….I will stick that thought over into the already brimming full “day dreams” list. 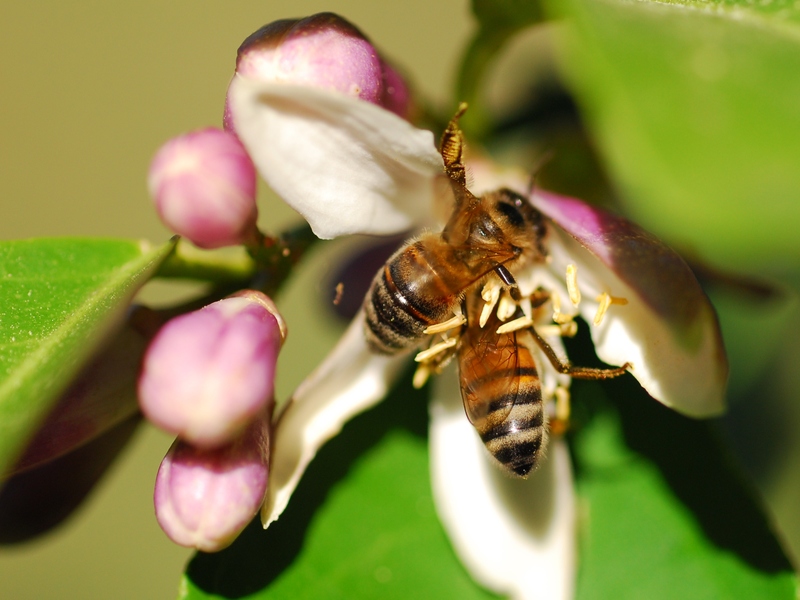 I have enjoyed the heavenly scent as well as the abundance of honey bees this year. Their hard work has the tree loaded with little green buds soon to become lemons. I will definitely have to do some thinning. A tandem attack on the lemon blossoms. The term” enjoying it while we can” started out in my head this morning as a reference to the weather, we are definitely enjoying this window of spring like weather. We have actually had the AC unit on several times in the past weeks but this morning was glorious. My head is also filled with the thoughts of all that I am able and capable of doing now….yes, I do enjoy it all!!!! The lesson from the experiment are many and a bit painful. Lesson number one – 3 inch drain pipe is too small – I debated and again the cheap side of me went with the lower cost….guess what. Sometimes more is better …. (I chose the politically correct phrase). The 4 inch pipe is probably a good choice but the more I look at it and work with the 3 inch pipe the 6 inch may be the best choice. Lesson number two – fill with the planting media as you plant. I filled the 3 inch pipes to the top before the plants arrived and it becomes a challenge to get the plants well seated. 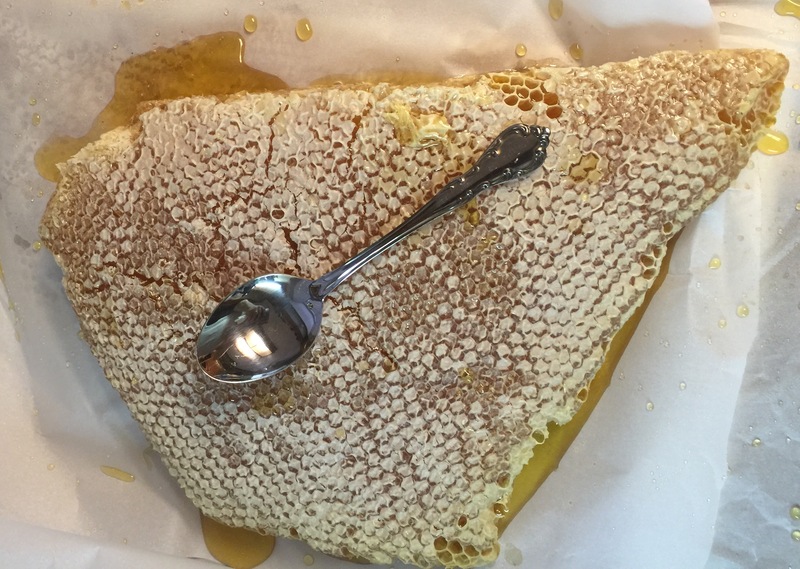 Lesson three – space the holes out in a less dense pattern. I chose a 90 degree orientation with the back side blank. I read an article a couple of months ago where a young lad experimented with spacing solar cells based on plant world configurations – something like Fibonacci numbers – and the results were amazing. So I may play around with real plant world arrangements like – 135° (or 3/8) : eight leaves in three gyres. The Fibonacci sequence would predict 137.5 degrees as an optimum spacing. That would be 8 holes in three rows and then repeat. Lesson 4 – the holes are probably the right size/diameter but the forstner bit leaves a sharp edge in the hole. Have you heard the joke where the patient says to the doc, “It hurts when I put my finger into the holes in the pipe!” The doc tells him, “The cure is to stop putting your finger in there!” I should have listened to the doc. I shredded the index finger on both hands – so the pain is evenly distributed. I think that helps? I think I will experiment with the 6 inch pipe this coming spring – I will be”frugal” and rather than build the towers using PVC Tees and Ells, I will use a post hole digger to set the pipe upright. I figure 12-15 inches deep should be sufficient. The warm weather is helping and hindering. 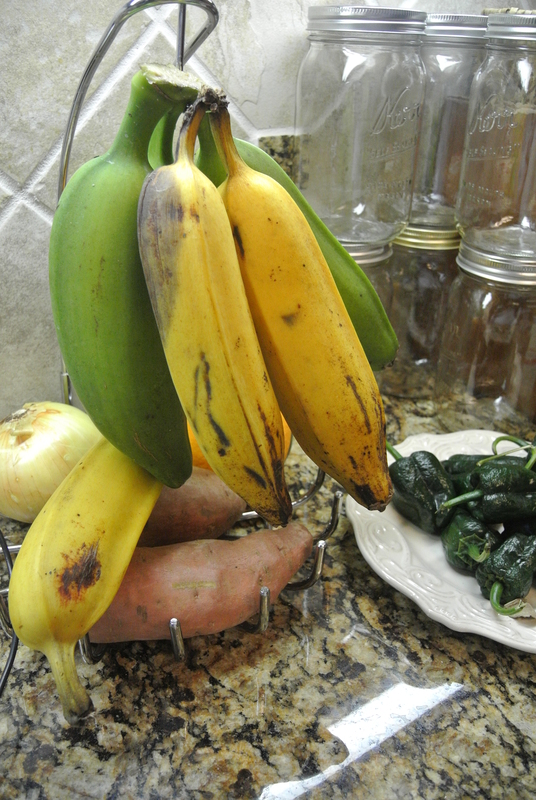 The help – I am still picking green beans and cucumbers… as well as bell peppers, yellow banana peppers, serrano peppers and radishes. 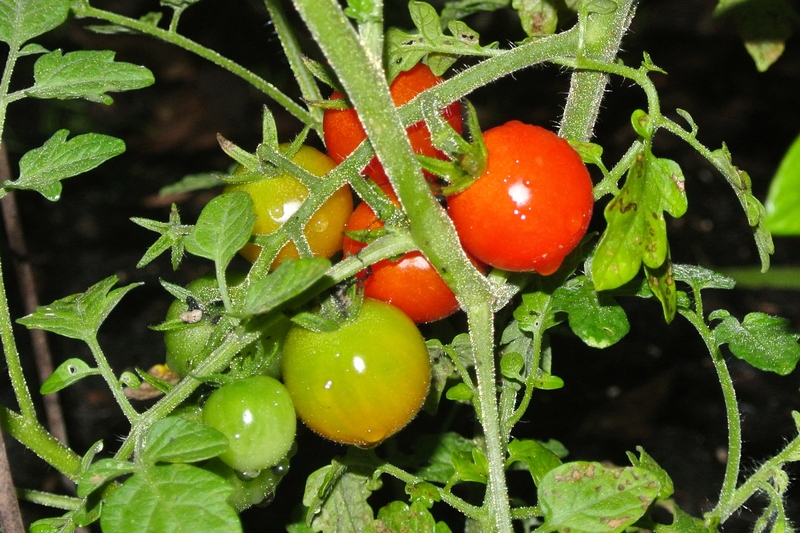 I picked all of my green tomatoesover a week ago thinking that November would bring some cool weather – well I should have waited. Is it Global Warming or too “dadgum” politicians spewing hot air????? 82 degrees F today, 28 C for the rest of the world. Now the bad. 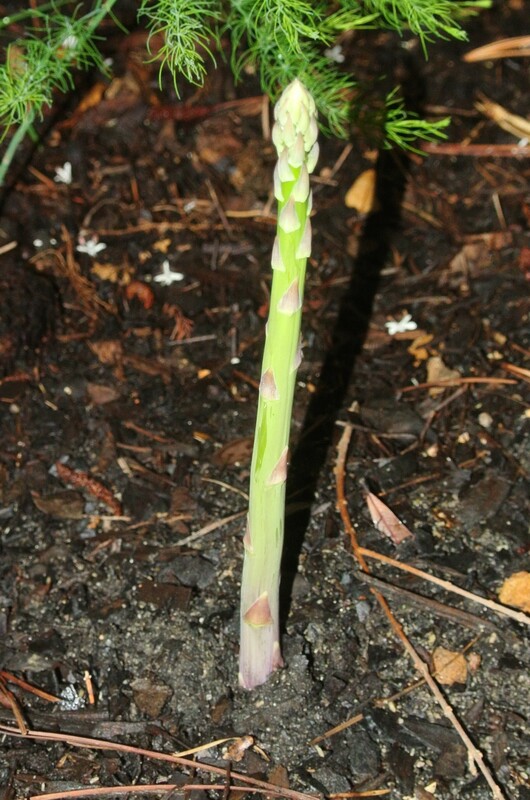 I am waiting for my asparagus ferns to respond to the cold, ha ha, and turn brown so I can cut them back. They are still green, still growing and sending up new shoots. So, …… ???????? I love puttering around in the garden an snacking on the fresh crunchy stuff. Fresh green beans today and a couple of sugar snap pea pods… not worth bringing into the house – just right for crunchy chewing in the garden. I just found this bit of advice while searching the internet today. “Lettuce also fails to germinate if the seed is old, so use fresh seed each season.” Should I take this advice???? I think I should! I looked at some of my leftovers and the dates on the packets go as far back as 2008! Looks like I am not frugal but the word cheap might be a better descriptor. I broke down today and spent $ 6.00 or so for some new, current season lettuce seeds. Weather is still on the cusp of being too warm…we will see 80 degrees this week again. 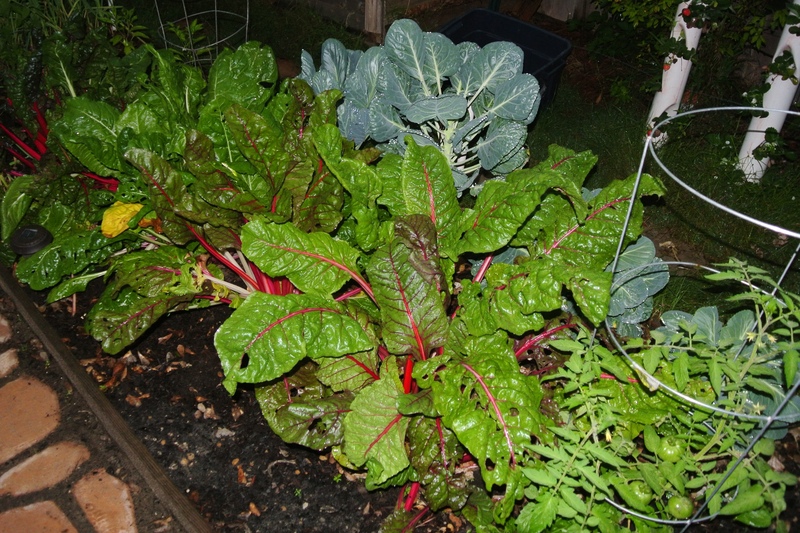 I planted lettuce today for the fourth time this “fall” – Hope I haven’t wasted my money….what if it is more likely the warm weather and not old seed? I guess I won’t ever know. I seem to use up almost all of the pea seeds every year and bought 2011/12 season sugar snap peas for this fall. I love this sequential depiction of peas sprouting. Most of my peas are further along than the right hand image. 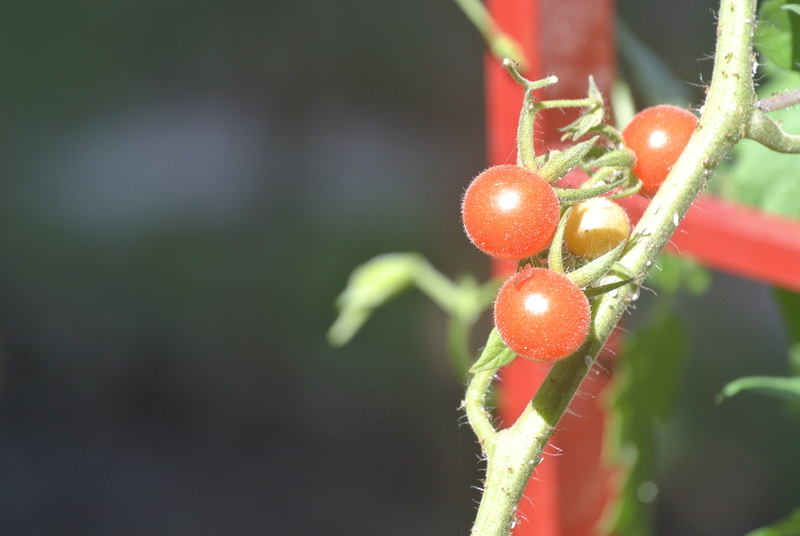 I noticed today that I have some up into the 15 – 18″ tall range and some flowers are beginning to develop. I am looking forward to the sweetness of fresh picked sugar snaps. The pole beans have just about stopped flowering so it looks like I will have a gap in the harvest. I didn’t have many beans today so most found their way into my mouth before they made the kitchen. They are actually pretty sweet but not like the peas. Still gathering cucumbers from my volunteer plants. These cukes are so good. Sometimes the Houston heat causes them to grow so fast they become huge and they can be a little bitter. The weather is perfect right now, the size of the cukes just perfect and they taste great.. I grilled some of the fresh red bell peppers from the garden tonight. I have a bunch of Serrano peppers to pick this week and will probably make some more Serrano Pepper jelly. So good over cream cheese as a dip. I also found some red onion sets at the store where I picked up the lettuce seeds and added them to the white onions I planted a few weeks ago. The white onions and the garlic are up and stretching toward the sky. Looking forward to late spring 2012 for the onions to be ready. I will be in the garden getting my hands dirty again tomorrow…..